As we humans live in “Time” we must choose whether to focus our attention on the Past, the Present, or the Future. As addicts or codependents it comes naturally to us to prefer to dwell in the Past, consumed by anger and resentment over real or perceived victimization or wishing things could be the way they used to be. We are also comfortable living in the Future, obsessed with either our fears of what will go wrong or our wildly optimistic certainty that our lives will be better as soon as —fill in the blank—. The Present, “the point at which time touches eternity,” as C. S. Lewis describes it in The Screwtape Letters, is the only time in which we can actually take action to improve upon the past, and ensure a better future. 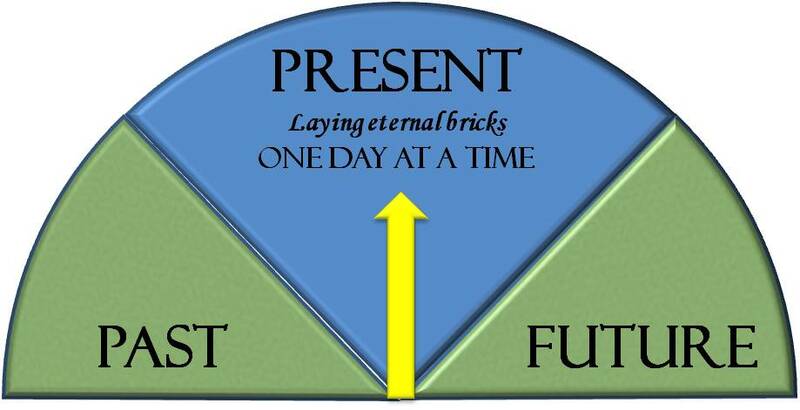 The Present is the time to build our eternal mansions, one brick at a time. Recovering addicts all over the world rely on the slogan “one day at a time” to remind us of how we need to live to build that mansion. When I was actively engaged in compulsive eating, I spent time thinking about and relishing memories of past food experiences and obsessing about what I would eat next and when. All the while, I mindlessly ate whatever was close at hand regardless of whether I was hungry or in need of nutrition, or else I deliberately overate food that I knew was not healthy or good for me in order to try to satisfy a craving of the heart. Eating was preferable to feeling my feelings and facing the reality of my life. In other words, Heavenly Father wants us to do the footwork He gives us to do, and turn over the results to Him; living fully in each moment, contributing all that we can to the world, patiently waiting upon His timing, and living in a state of gratitude for our blessings. Which time do you inhabit most: Past, Present or Future? Why? Are you living each moment being fully “present” in the Present? If not, why not?